Making the Internet better since 1995. 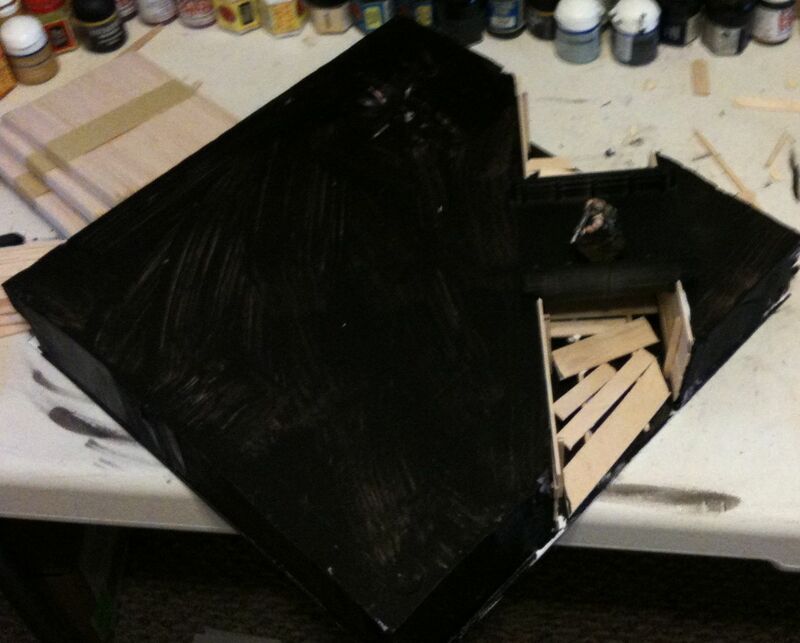 So after carving my foam and painting it black, the next step was to line the trench sides and bottom with planks or in the miniature wargaming world, Popsicle sticks and tongue depressors. These can be bought at most craft stores along with more precision cut pieces of balsa wood. 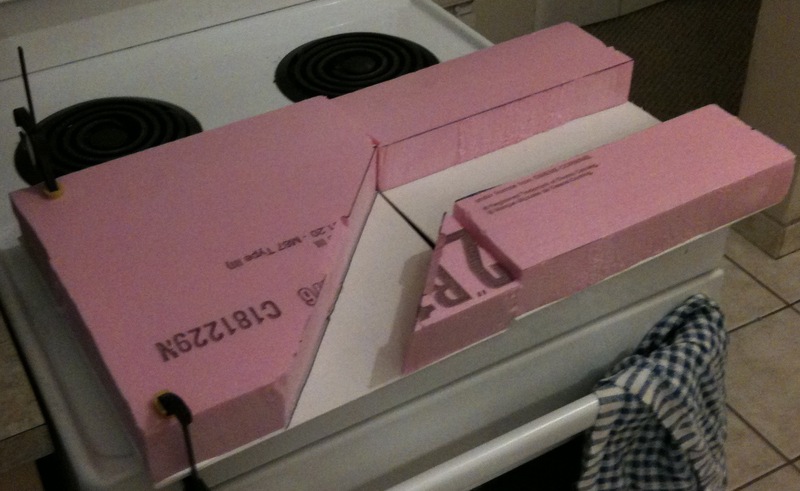 My trenches turned out to be just under five Popsicle sticks deep. This tile has a removable foot bridge which used to lay flat in the trenches when not needed, but after lining both sides it doesn’t. I’m not sure on the front lines you saw bridges across trench works much, but further from the front they were needed to send out patrols and what not. This tile also got two little sandbag walls, made by this fella. This gives any sentries something to hide behind or lean on. 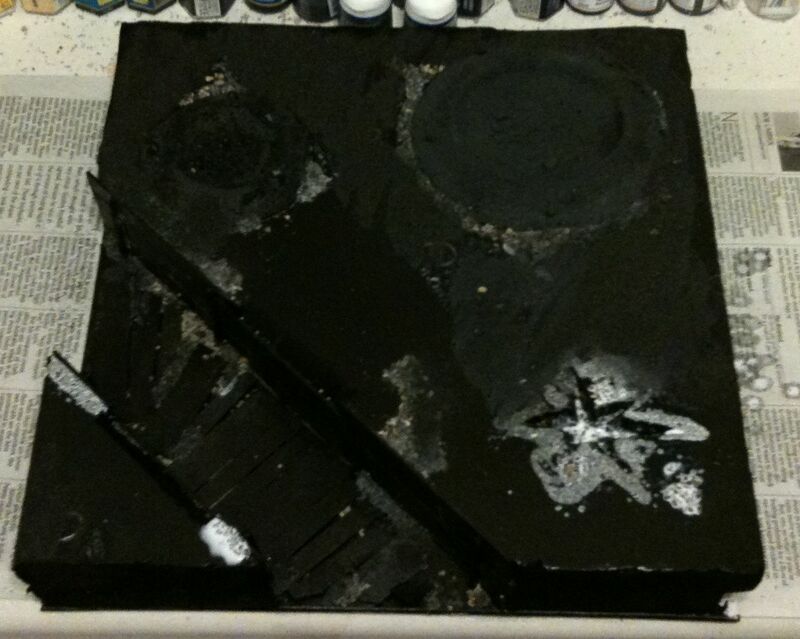 I also allotted two surface craters to this tile, these were rather cheap and flimsy. I don’t advocate buying craters for the most part, as they are make-able, but then again I bought lots of sandbags and they are make-able too. 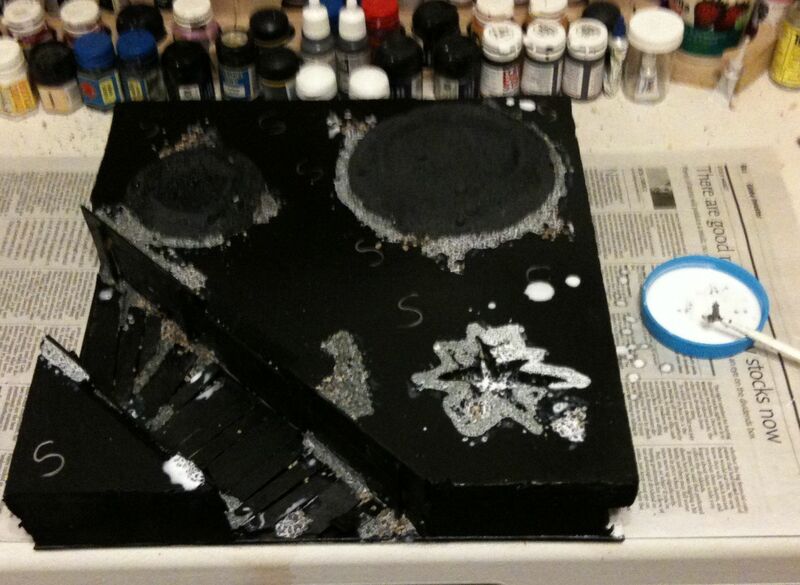 I went against my golden rule of maximum modularity and glued the two craters to the tile. They were pretty lightweight foam so I thought this was for the best. 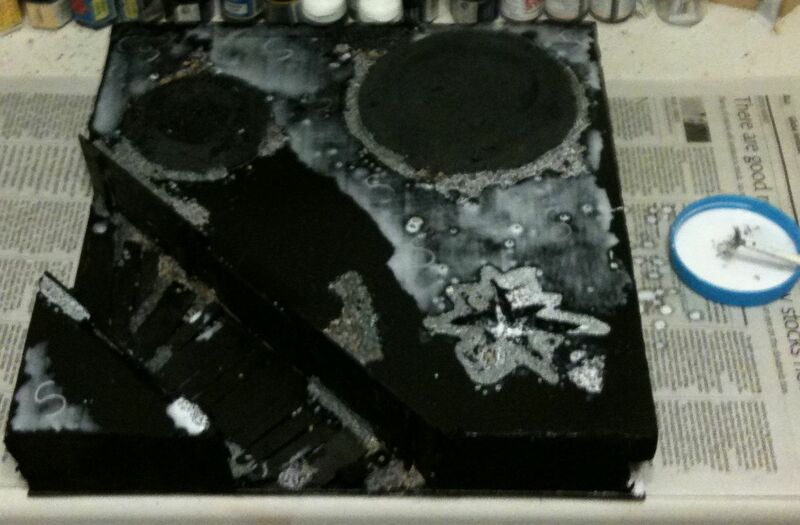 After coating everything black once more it was time for the first texturing. Due to cost and availability I use cat liter for this. 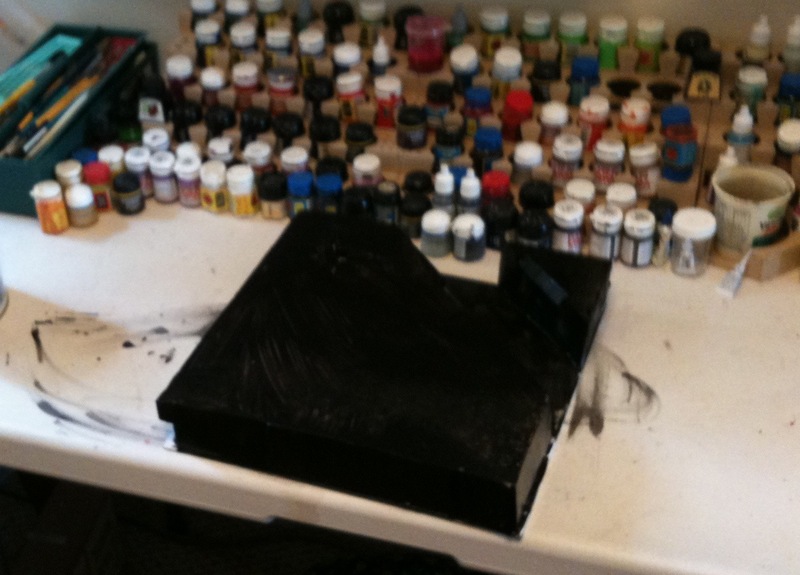 The problem with cat liter is it is porous so painting is a bit more work, it is also dusty which is why you need to use cheap black paint early and often. After the glue hardens I’ll do beach sand, then probably this finer grained sand I got from somewhere years ago. Beach sand as long as it is dry is great due to being more irregular than hobby sand. Once again I took a bunch of pictures at each step, including posing with my test guy, a technique I got from someone on the Waaagh. I need to name my Imperial Guardsmen at some point. 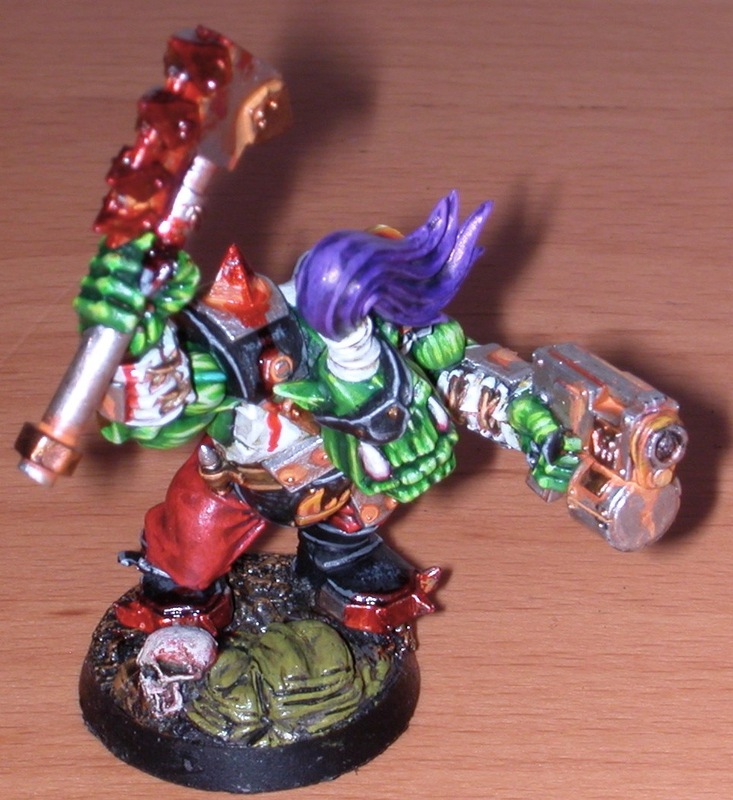 The test ork is named Barry… Oh the bridge is made by Snapdragon but he doesn’t make or sell much stuff anymore. 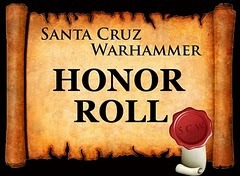 Yep, the most overused title in the miniature painting hobby. 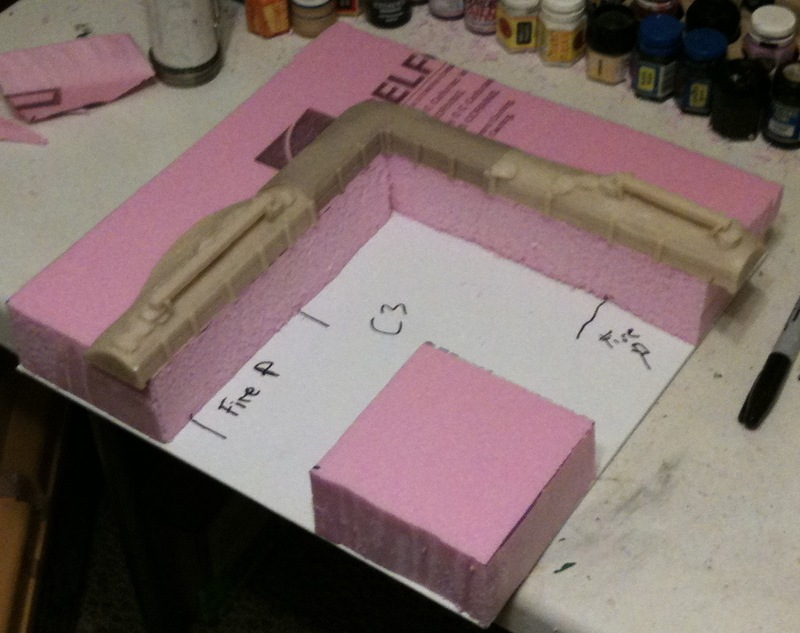 This is actually really important, having made several display bases, nothing cramps your style while doing the final details like pink or white foam poking through. 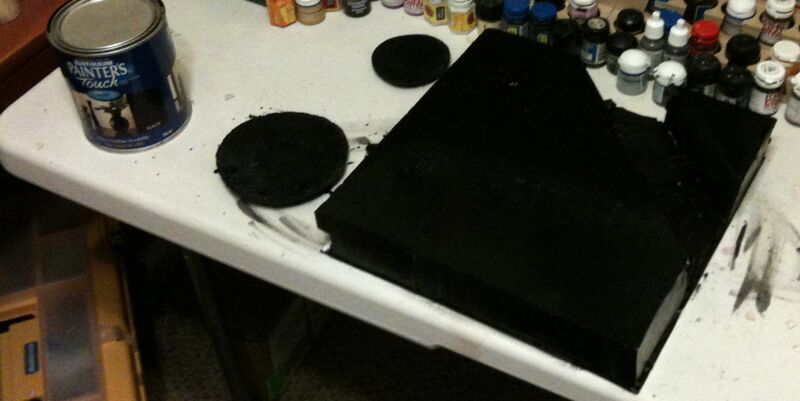 So this rather large undertaking I vowed to paint it black early and paint it black often. 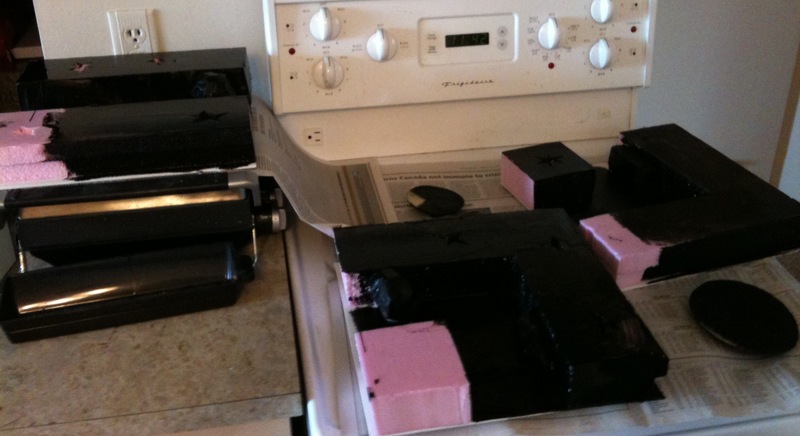 I’ll paint some more black on these but first I’ll probably put down the timbers inside the trenches. After that is done I’ll do the sand. 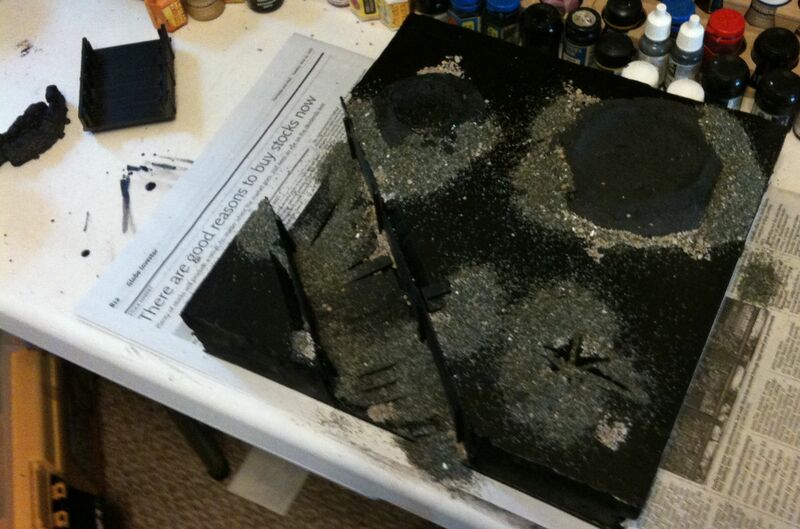 I don’t want to sand all the flat surfaces and I can’t use as much cat liter as I did on my GT display base, it looked good but it isn’t game-able. This table needs to game-able, that means wider than usual trenches, modularity, less than perfect fits, and lots, and lots of little pieces that can be re-arranged. One of my long schemed for mega projects is a dedicated gaming table more befitting of my tendency to play almost exclusively Warhammer 40,000. Of course by play I mean occasionally attend a local tournament, say two a year, with one or two in-store games. 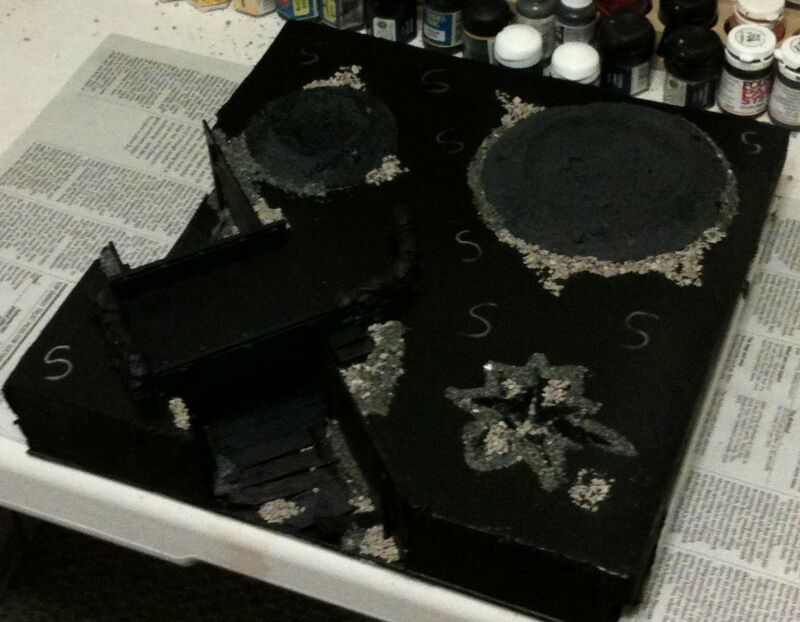 I think you play more when you can host, and in order to host you need a reasonably sized place and table plus terrain. I have over a table worth of hills and forrests plus some rocks and the odd building, but with the success of one of my tournament display boards and the amount of stuff you can buy online, I decided to build a really nice table and I decided to make it a modular trench table. I did a lot of research, I collected a lot of resin scatter terrain and bits I would need to build my table, but time and energy proved ellusive. Recently unemployed I’ve worked on my dream table, but I discovered my hobby foam cutter couldn’t handle the big thick foam I wanted to work with and it was hard to make long perfect cuts. I bought a jab saw along with a couple metal squares, but I had to give up on perfection. 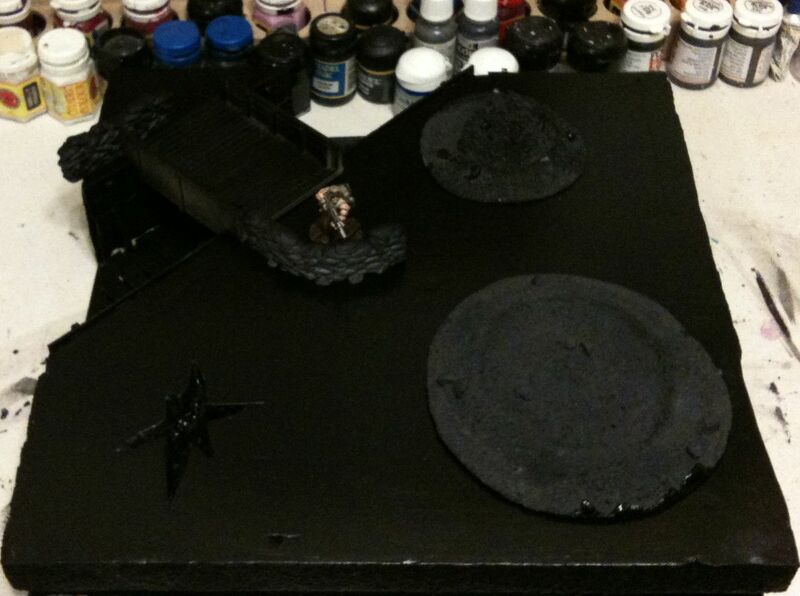 Working on terrain pieces takes a lot more space and makes a lot more mess than painting another squad of plaguemarines. Undaunted I’ve pushed on. 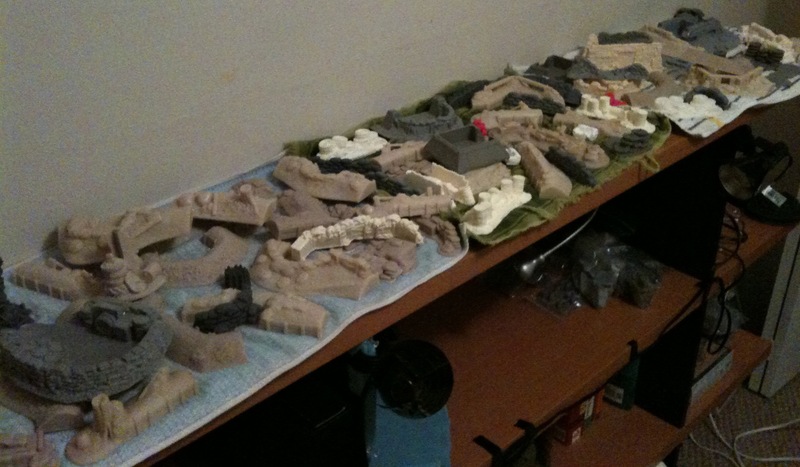 I was originally going to make one or two squares at a time, but in order to get a decent fit and to better lay out the scatter terrain I ended up cutting and carving almost one entire defensive line before I painted anything. My plan is to paint the white and pink black. 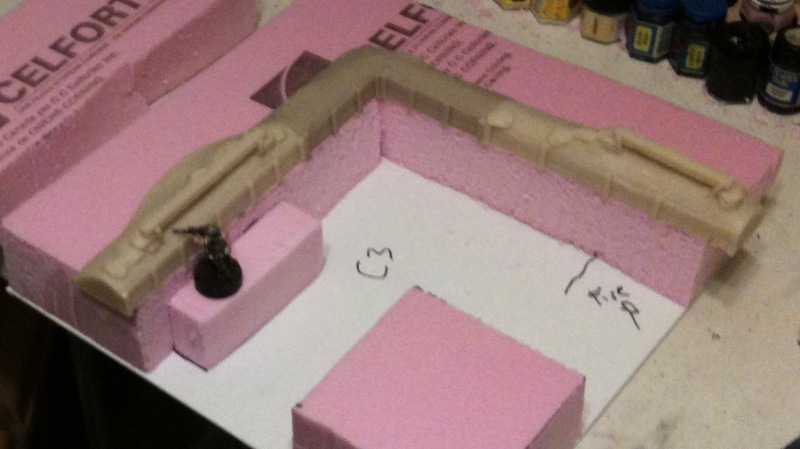 Then I plan to line all the trenches sides and bottoms with little bits of wood. This is historically accurate and although this table will probably get used mostly for 40K, there is no reason it can’t serve for World War One or even World War Two in a pinch. I plan to paint up some Germans and Van Doos someday. I painted one test dude, you can see him making sure the firing platforms are the right height. I made my trenches deeper than most and wider than I intended. The first square I did was the angle one and three inch wide openings and then drawing the lines looked too narrow. 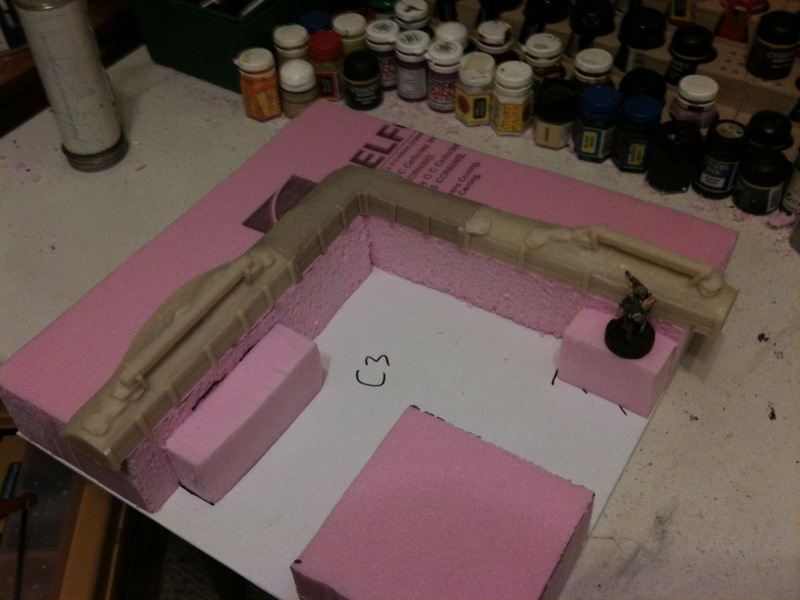 I want to be able to fit 40mm bases in my trenches along with the planks and firing positions and some scattered stuff. I’ll make some narrower trenches eventually, but the two initial defensive lines will be bigger than scale to make it easier to game. 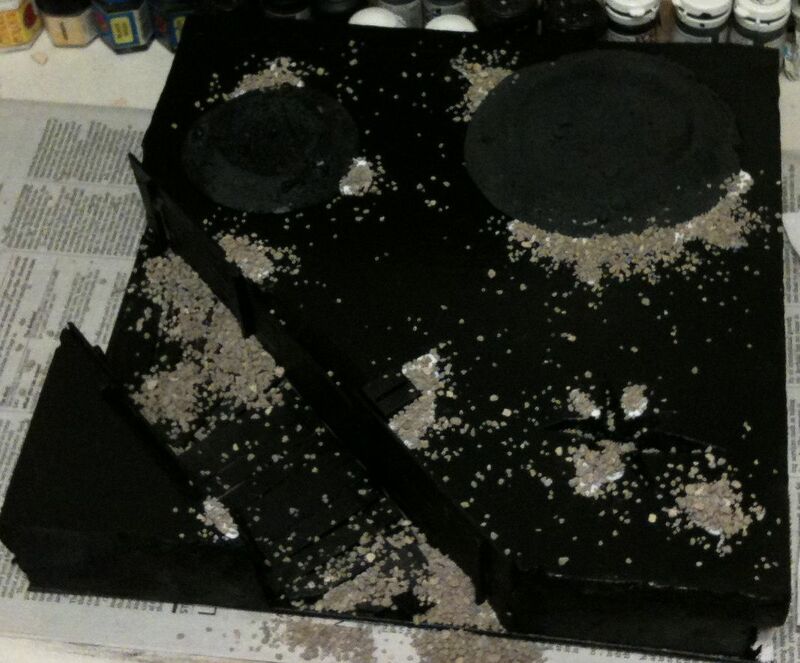 Almost all the scatter terrain will be loose and thus can be rearranged along with the tiles. I’ll make a dozen or so extra tiles eventually, but to start I’m make 24 carefully planned tiles. There are some early ramblings on my personal blog about this and likely on the odd forum, but this is the most I’ve revealed my hand. I need to switch shortly to finishing up my Astronomi-con Vancouver army, so this table will not be at Astro Van this year, but will be next year for sure. All the resin terrain show on the tiles so far was made by Snapdragon (Moondragons.com) he stopped making them due to injury so I bought rather more than I needed, just before he went out of production, as I thought it would just make things look better. Other companies I’ve ordered from are listed here. It seemed to me that before the posts were appearing in reverse chronological order. I’ve never seen that before, WordPress is always adding new features which is another reason I have a WordPress.com blog to expirement with, but also a self hosted blog that I can test things out on. 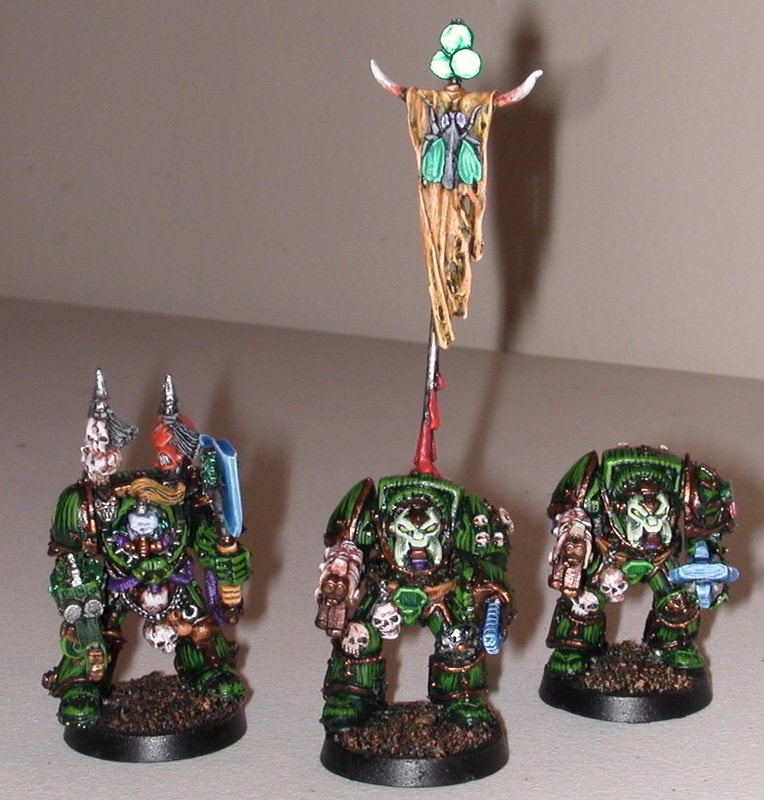 I dug up another photo which probably hasn’t been widely seen, instead of an Ork Nob it contains three OOP (Out of Print) Chaos Terminators. I’ve got a lot of painted terminators that I never use, I plan to rebase them. I have some of the Forgeworld Nurgle ones on my table which I’ll get to in a couple months, they seem to always get put off, as mainly they are just for fun figs. Nurgle terminators are too expensive pointswise to use regularly in small scale Warhammer 40,000 games. I painted them quite a while ago, I’m not even sure they’ve all hit the gaming table, but they probably have by now.